The Enterprise stumbles upon a legendary utopia, Aldea, but things quickly take a turn when the Aldeans kidnap several children. It was only a matter of time before something like this happened. When you put families with on board your ship, they are going to be threatened eventually. This is one of the things that separates this Enterprise from Kirk's, that it has families on board. I understand that, since the ship is so huge, goes on such long voyages, and the mission is one of peace and science, it is only natural to have families. However, there is a downside to all that (especially in the Star Trek universe, where unpredictable dangers are everywhere), and it is explored here. The least they could do is make sure the children never wear red shirts. The old musician with the little girl is really creepy. 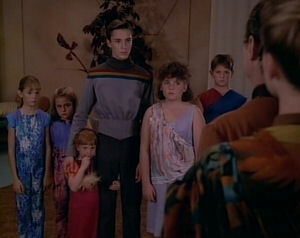 Wesley scanning for Dr. Crusher is about the worst job at being incognito I've ever seen. Clearly, Starfleet doesn't train for espionage. Sometimes I wonder why the Enterprise never calls for backup. I get that it's the biggest ship in the fleet, but in a situation like this one, there's strength in numbers. The Aldeans have committed an act of war and threaten to do more if Picard doesn't back down. I can think of no better time to bring a show of force. I understand that it's a delicate situation, that the Aldeans have unknown technological capabilities, and that Starfleet uses force as an absolute last resort, but it's strange that nobody even suggests calling home. When Radue threatens to send the Enterprise so far away that, by the time they return, their "children will be grandparents," it seems like a worthwhile precaution to at least have a fleet on standby. This episode has a lot in common with Lost (spoiler alert for miscreants who haven't watched Lost). You have a hidden place where people went long ago to improve their art, science, and culture. The people then lost the ability to procreate, and so they kidnap children (especially "special" ones) and pretend like they're the good guys for doing it. Way to go, Wesley. At least, this time, it isn't about him being clever or noticing something the adults are too obtuse to notice, a storyline that got old about a dozen episodes ago. Instead, here, he actually comes up with a low-tech plan, shows some leadership, and rallies the troops. It's nice to finally see some character growth. I'm glad they included the character of Harry, who actually kind of liked being on Aldea. When he thanks his would-be parents for teaching him how to sculpt, it keeps things from being completely black and white, as they otherwise would have been.